The region of Minnesota was first explored by French fur traders in 1659 to 1660. Then, explorers Marquette and Joliet who had been over the Michigan region came northwest into Minnesota by 1673. The main Native Indian tribe in the region was the Dakota people. Another tribe, the Anishinabe, came in by 1745 to defeat the Dakota tribe and forcing them to the southern end of Minnesota. In 1763, Spain receives Louisiana Territory which includes Minnesota west of the Mississippi River, from France at the end of the French and Indian War. England get the area east of the Mississippi and develops Grand Portal as the fur-trading headquarters of the British Empire in North America. The whole Minnesota region, no matter who was in control, continued in the fur trading business throughout the 18th and 19th century. After the American Revolutionary War, the new nation of the United States now has control of the eastern side of Minnesota which the English just lost. This region becomes part of the American Northwest Territories. By 1800 France regains the western portion of Minnesota from Spain, but it is sold as part of the Louisiana Purchase to the United States in 1803. A peace treaty with the United States is completed by 1815 with the Dakota tribe in the lower end of Minnesota. New forts were constructed in this vast wilderness. Emigration into Minnesota was slow over the early years. By 1849 the settler population amounts to less than 6,000 people. Most of the people become involved with wheat farming. In the 1850s the population exploded in Minnesota with a major influx of new settlers, many from foreign counties. This is an important note on the growth and type of people in Minnesota genealogy. The region went from 40,000 people in 1853 to approximately 150,000 people in 1857. On May 11, 1858, Minnesota enters statehood as the 32nd state. During the American Civil War, Minnesota supported the Union and provided 24,000 men for service in the Union Army. During that time there was a series of attacks by hungry Dakota enraged by the failure of the U.S. government to honor treaties. During those Indian raids, 486 white settlers were killed. Eventually many were captured , tried and 38 Dakota Indians hung. In the 1870s wheat production increases and more farmers arrive in Minnesota. In the 1880s the mining for iron increases and by 1900 lumbering becomes big business. It was during this time of great emigration into the state. The European immigrants were chiefly Germans, Swedes (who were farmers), Norwegians (worked the lumber mills), Danes, English and Poles (meat packing), along with the Irish and some French-Canadians. In looking at Minnesota genealogy, in the late 20th century there were still many Native Indians, some 55,000 in Minnesota. The African-American population has increased as many came after World War Two for jobs. In 2009, about 4 percent of the population is African-American. Today those with German ancestry represent 38 percent of the population. 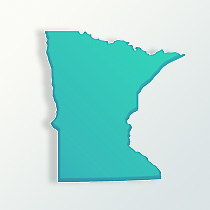 Minnesota’s total population in 2009 is about 5.3 million.